If you are looking for a more intimate place than most of the tourist places in Armacao dos Buzios, then the Brava Beach is the for you. A few sunbeds and umbrellas are available at the beach while a nearby restaurant serves lip-smacking food and drinks. The beach is a common haunt for surfers and is a secret romantic hideaway if you want to dodge the crowded beaches in town. The location is known for its picturesque beauty and if you are carrying a camera, you wont stop clicking! Wear sunscreen and carry other beach essentials. How popular is Brava Beach? People normally club together Forno Beach and Rua Das Pedras while planning their visit to Brava Beach. Gorgeous Beach! Wasn’t too packed either! We got an umbrella and two chairs for 30R. They serve drinks and food right to your chairs too. Beers are about 10R each. Highly recommend! Nice beach for drinking, surfing and restaurants. Avoid normal swimming. My favorite beach in Buzios. Brava and Bravinha, two beaches separated by just a low stone formation that can be walked over, are the perfect place for those who appreciate calm and quiet and vast. It's unique shape allows waves to form on one side while the other remains perfectly still. Water is very clear, around 70 percent, and the sand is slightly pinkish. There are services such a umbrellas, seating and food and it's fairly not crowded. 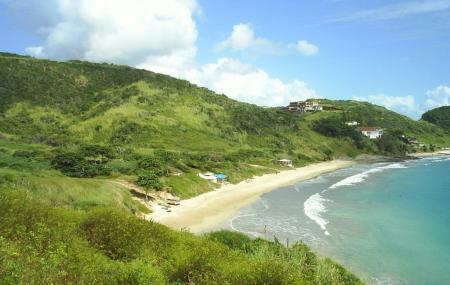 Bravinha also grants access to Praia Olho de Boi, the only nudist beach in Buzios, by climbing the left side hill.